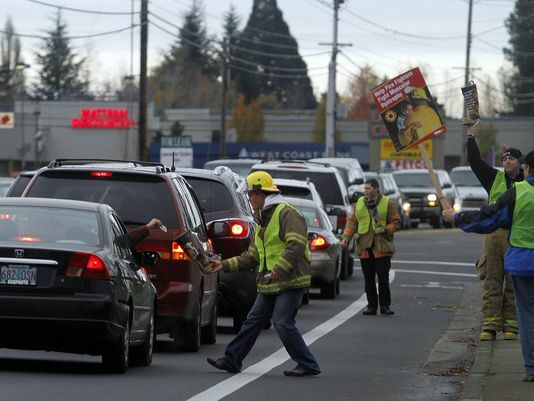 PA volunteer firefighters can now ease funding woes by soliciting drivers on the side of the road – Is this what we want for our first responders in Tredyffrin? PA Governor Wolf signed new legislation last week (Act 57) which allows first responders to solicit donations at stop signs or traffic signals. Fire companies will need to get written permission from the local municipality and the solicitations are to drivers are limited to controlled intersections (stop signs or traffic signals) and are required to have the necessary liability insurance. The new law goes into effect within 60 days. This new fundraising legislation may be a useful tool for some volunteer fire companies in Pennsylvania; particularly rural or areas suffering severe economic issues. But the question for Tredyffrin residents is whether we want to see our volunteer firefighters soliciting drivers on the side of the road as a way to fill budget gaps. Representatives from fire companies (Berwyn, Paoli and Radnor) that serve Tredyffrin Township residents have repeatedly voiced concern about the increasing demand for fire and rescue services and the lack of reliable funding. 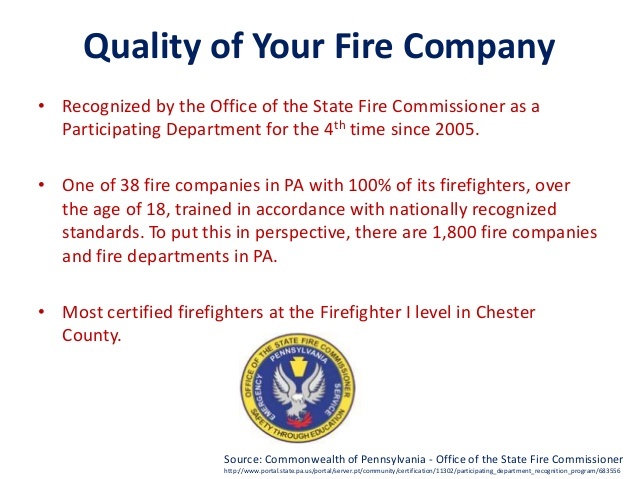 As a result, T-E Fire Companies Funding Coalition comprised of fire companies from Berwyn, Paoli, Radnor and Malvern was formed with a mission to work with government officials to provide sustainable and adequate funding. The ongoing need for recruitment and retention of volunteer first responders remains a concern. The time demands for volunteers are so severe, both fire-related and otherwise. Because people are spending more time on their ‘day’ jobs – there’s just less discretionary time to do anything else, including being a volunteer. For those who do manage to carve out time for serving as a volunteer firefighter, they want that time to be directed towards firefighting responsibilities not used for fundraising. The cost to maintain a fire company; its building, equipment, training – continues to increase, with the cost of a new fire truck running in the tens of thousands of dollars. With the growth of both residential and commercial development in the area, the demand for fire and emergency service also continues to escalate. According to the Berwyn Fire Company, less than 25 percent of fire service funding comes from the government. If the fire companies shuttered its doors, the township would still be responsible for providing fire protection. The old formula is no longer working … there is a need for sustainable funding. Tis the season for budget discussion, including fire department funding – the Board of Supervisors meeting at 7 PM tongiht includes the ‘2016 Preliminary Budget and on Thursday, November 19, 10 AM – 12 PM, the public is invited to attend the Budget Open House at the township building. Our volunteer firefighters should not be forced to close budget gaps with car washes, turkey raffles, spaghetti dinners or soliciting drivers on the side of the road. These young men and women need to know they can count on our elected officials to provide adequate and sustainable funding. Continuing the substance abuse discussion, Berwyn Fire Company EMS Capt. Michael Baskin provides background about Narcan and its use in heroin overdose situations. Important contact information is provided at the end of his remarks. 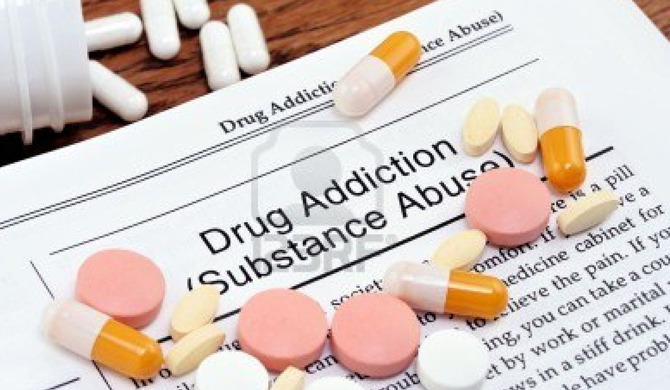 As a resident, it is reassuring to know that the local fire company and police department personnel are trained and equipped to handle drug abuse situations. Discussions about drugs and their consequences are extremely important — perhaps a community forum with the school administration, police department, fire company, parents and residents. Thank you for bringing some of these concepts to the forefront of your community readers. Naloxone, also known as Narcan, is a medication used in opioid overdoses to counteract life-threatening depression of the central nervous system and respiratory system. If administered early enough, an overdose victim will begin to get a respiratory drive back, and shortly after become alert and aware. Naloxone only works if a person has opioids in their system; the medication has no effect if opioids are absent. There are many drugs that people overdose on that Narcan has no effect on. It is a temporary drug that wears off in 20-90 minutes and therefore anyone who received this drug needs to get to advanced care as the effects of the opioid may return after Narcan wears off. As was noted, Tredyffrin police have been carrying Narcan for a little while now and have already administered it successfully. Berwyn, Radnor and Malvern fire company paramedics (the 3 primary paramedic providers to T/E) and other services have had Narcan as Advanced Life Support (ALS) providers for decades. As of July 1st, 2015 the Department of Health has allowed for Basic Life Support (BLS) to have access to Narcan in addition to the ALS. Departments across the Commonwealth are going through training now. From a community approach perspective, the T/E community is well covered with Narcan access in an emergency. In extreme situations, providing rescue breathing and/or CPR to an overdose victim who is not breathing will provide needed oxygen prior to emergency services arriving. The ideal community focus needs to be preventing the need to ever use Narcan. Community, family and professional help should be available to anyone who needs it. Accepting that our community is not immune to these problems is a very big start. Community education of drug, alcohol, mental illness and suicide prevention is a tremendous help. Acceptance of those who have these problems as a community is what leads us to success. By isolating, hiding, alienating or ignoring people who need guidance, we hurt rather then help this goal. The Chester County Drug & Alcohol Hotline: 610-344-6620. These numbers are just as much for someone searching for help personally as they are for someone concerned about another. Easttown Township meets the 2015 financial request of Berwyn Fire Company – Will Tredyffrin supervisors step up to the plate? Depending on where residents live in Tredyffrin Township, your fire and emergency medical services is provided by one of three fire companies – Radnor, Berwyn or Paoli. In their 2015 budget presentation to the supervisors of Tredyffrin and Easttown Townships, the Berwyn Fire Company asked for $50K in extra funding from each township to fill staffing coverage gaps. Citing an increase in service calls, the fire company asked for the additional contribution to hire a full-time employee to ensure adequate staffing levels. According to the fire company, the requested funding is to address problems with simultaneous EMS incidents and for lower volunteer turnout situations for fire and EMS calls. (Click here for Berwyn Fire Company’s budget presentation). The Easttown Board of Supervisors heard Berwyn’s appeal and delivered the additional $50K funding in their proposed 2015 budget for the fire company. Actually, the Easttown supervisors took it a step further than requested – the township officials are looking at ways to provide ongoing sustainable funding to allow the Berwyn Fire Company to better plan for future needs. Unfortunately, for the Berwyn Fire Company, the elected officials of Tredyffrin Township did not respond similarly to their funding request as the Easttown Township supervisors. Tredyffrin Township’s preliminary 2015 budget indicates an increase of $5,670 in funding to the Berwyn Fire Company, falling far short of the fire company’s $50,000 request. Interestingly, Paoli Fire Company receives $2,700 additional funding for 2015 whereas Radnor Fire Company is slated to receive no increase in funding from Tredyffrin Township. It should be noted that Radnor Fire Company receives an annual contribution of only $23,700 from Tredyffrin Township, … yet, Radnor Fire Company is the primary Fire/EMS provider to the Panhandle residents of Tredyffrin Township. For the sake of fairness, and to avoid ill will among the three fire companies, it would seem that each service provider should receive a comparable annual percentage increase in funding. • Need to ensure adequate paid staffing around the clock. The Berwyn Fire Company makes the case on their website, (www.berwynfireco.org) that without the fire company volunteers, it would cost Tredyffrin and Easttown taxpayers, “an estimated $1.8 million in salaries and benefits” to staff just one fire engine and one ambulance around the clock. Plus, this $1.8 million figure “does not include building, apparatus, operating and other costs associated with operating a fully paid fire/EMS department.” To date in 2014, the Berwyn Fire Company has responded to 845 fire calls and 2,045 emergency service calls. In their budget presentations to Tredyffrin and Easttown supervisors, in addition to increased call volume, Berwyn Fire Company cited increase in residential structures, increase in commercial structures, and increase in volunteer and paid staffing needs, need for fire inspection, fire and life-safety planning needs as additional funding requirements. 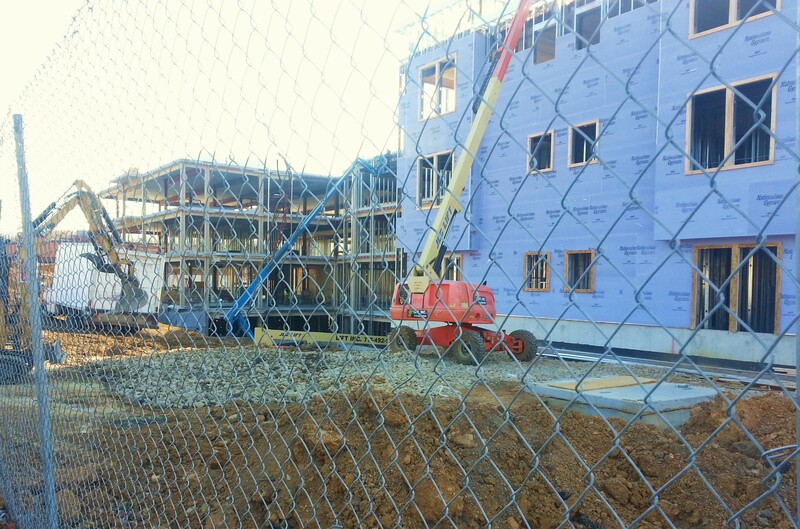 Although the community is glad to see new development and redevelopment projects, it should be acknowledged that these new projects increase pressure on the fire companies to meet the needs. Case in point – the construction of the much-debated assisted living project, Daylesford Crossing on Route 30 in Daylesford is well underway. 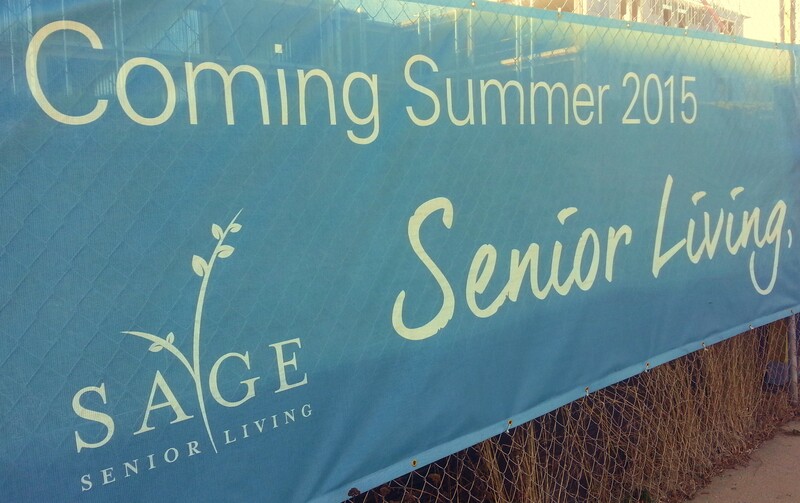 The 78-unit personal care apartments and specialized dementia care suites is set to open in the summer. Berwyn Fire Company will be responsible for all the advanced life support calls at Daylesford Crossing. (Paoli Fire Company will respond to the fire calls). For further information about Berwyn Fire Company, and to find out how you can help, please contact Fire Chief Eamon Brazunas at firechief@berwynfireco.org or Fire Company President, Nam Truong at president@berwynfireco.org. There’s still time for an adjustment in Tredyffrin Township’s contribution to Berwyn Fire Company — the supervisors will approve next year’s budget on Monday, December 15. (Click here to see Tredyffrin Township’s proposed 2015 budget). Show your support for Berwyn Fire Company by contacting your elected officials and ask them to honor the fire company’s request for additional funding. Improving Conditions in Tredyffrin Township — Power Returning to Many Households! What’s the saying, “Rome wasn’t built in a day” – the same could be say about restoring power to Tredyffrin Township and its surrounding areas. Downed power lines and toppled trees left many roads impassable and neighborhoods with dangerous conditions. Winter Storm Nika is PECO’s second worst in their history in terms of power loss, exceeded only by Hurricane Sandy in 2012. However, as the third day without power ends for many residents, there are improving conditions to report. Tredyffrin Township now has a crew of 75 PECO trucks, each with 2 employees, dedicated to our township and focused on completing the restoration of all power to residents. The repairs on the main sewer break at Rts 252 & 23 in Valley Forge National Historic Park are progressing and the township’s Public Works and Engineering Departments are moving quickly to resolve the problem. Tredyffrin Township building is open as a warming and charging station. Although the website states the building is open until midnight, the township building will be open through the night, Saturday and Sunday, if needed. Coffee and tea is available. Supt. Giaimo strongly urged residents to check on their elderly neighbors. If you are without power and need a place to stay, the police have an updated list of available local hotels. They are also arranging for transportation to West Chester shelters, either by buses or in some cases, the police are driving the residents. Residents are encouraged to utilize the resources available at the township building. Much improvement has been made on the road closures with many re-opened today. Supt. Giaimo assured me that many in the Police Department “have been working around the clock to keep people as safe as possible”. The hope is that most of Tredyffrin Township should have their power restored by Saturday night – although it may be Sunday for some of the outlining areas. People are reporting repair crews have arrived from all over the US –Ohio, Illinois, Alabama, Florida, North and South Carolina, Connecticut, Massachusetts and even crews from Canada! It was interesting to hear a PECO representative say that they usually don’t receive a high volume complaints in a power outage until about the 72 hour mark but that this time the complaints started at less than 24 hours into the outage. However, unlike the August storm of Hurricane Sandy, residents are dealing with below-zero temperatures during Winter Storm Nika. Although I think that PECO could have moved quicker to organize following the power outage and PennDOT did not do its best at handling snow and ice covered roads, I have the highest praise for our home team in Tredyffrin – Supt. Giaimo and the Police Department and Township Manager Bill Martin and his support staff, public works and engineering staff. In addition, we thank the Berwyn Fire Company Chief Eamon Brazunas and his staff of volunteer fire fighters and Chief Ira Dutter and the volunteers of Paoli Fire Company. Many of these folks are exhausted having worked long hours, and in many cases leaving their own families and houses with similar power outages to help us – the residents of Tredyffrin – and deserve our appreciation and gratitude! The Berwyn Fire Company members encourage the public to attend and bring the family. Fire and rescue demonstrations will be conducted and the fire trucks will be on display. As a reminder: Bridge Avenue will be shut down between Lancaster Ave and Berwyn Ave beginning at 3:15 PM. Parking will be available on the Westside of the old Eckerd drug store property directly across the street from the fire station. Install smoke alarms inside each bedroom, outside each sleeping area, and on every level of the home (including the basement). Interconnect all smoke alarms in the home so when one sounds, they all sound. Test smoke alarms at least monthly and replace all smoke alarms when they are 10 years old or sooner if they do not respond when tested. Make sure everyone in your home knows how to respond if the smoke alarm sounds. Pull together everyone in your household and make a plan. Walk through your home and inspect all possible ways out. Households with children should consider drawing a floor plan of your home, marking two ways out of each room, including windows and doors. If you are building or remodeling your home, consider installing home fire sprinklers. Berwyn Fire Company Could Win $10K . . . They just need a few minutes of our time! Here is a very easy way all of us can help Berwyn Fire Company and it just takes a few minutes of your time. 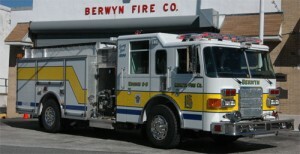 The Berwyn Fire Company is competing with fire companies nationwide for a $10,000 grant from Liberty Mutual Insurance Company. How does the contest work? It’s easy; the fire company who gets the most people to complete a fire safety survey online by October 31 wins the grant! If the Berwyn Fire Company wins the grant, they will use the money to help pay for gear and supplies used in firefighting and emergency response every day. Take the Fire Safety Pledge (bottom left). They will email you a confirmation message. When you receive the confirmation message, you then click on the link and the Berwyn Fire Company will have the vote registered. You can live anywhere in the US and still vote for the Berwyn Fire Company. Please support one of the busiest fire and emergency medical response organizations on the Main Line. Forward this post to everyone you know – let us help Berwyn Fire Company win the grant. Remember folks, our fire companies are volunteer organizations and a $10K grant can really help their budget! This morning I received an email from Rip Tilden, president of the Berwyn Fire Company. Although he reported that the fire company is currently in the lead for the grant, he is encouraging everyone to show their support for our volunteer firefighters by participating in the survey. I took the survey – 10 questions and less than 5 min. of your time! I checked and yes, Berwyn Fire Company is currently in first place in the ‘medium fire company’ category but Middleton Fire District from Middleton, Wisconsin is not too far behind in second place! Much can change in 30 days – let’s not take any chances. If you are reading this post, click on the link above and take the survey – now! You’ve got 5 minutes to spare; help Berwyn Fire Company take home the $10,000! Fire Funding Crisis for Berwyn, Paoli & Radnor Fire Companies. . . the ‘real’ story! I am always appreciative when Community Matters readers send me local articles or links that I may have missed. I received a great article today – the new edition of Main Line Today contains the article, ‘The Price of Rescue – Financial alarms have begun to sound at area fire and ambulance companies. What happens if the dollars dry up? (Can we afford to find out?). The well-written article by Jim Waltzer highlights what many residents in Tredyffrin and other local municipalities have known for a while now, and what we have been hearing from our volunteer firefighters. Our local fire companies are coming up against the money crunching of local township budgets and quickly facing a funding crisis within their organizations. Below are some of the highlights excerpted from of ‘The Price of Rescue’, click here for the complete article. Once again, on behalf of the Berwyn, Paoli and Radnor fire companies . . . please remember our volunteer firefighters (particularly during the holiday season) with a generous contribution. These men and women put their lives on the line every day for each of us! “ . . . money is as critical as water to firefighting, an essential service built on a powerful volunteer tradition that, hereabouts, dates to Benjamin Franklin. And since cash flow is so uncertain in the current climate of economic tightening, fire companies are transmitting distress signals. A 5-percent reduction in Tredyffrin Township’s portion of fire-company funding triggered a strong response from the firefighting community late last year, though private contributions restored the shortfall. “[But] what happens next year—and the year after?” poses Matt Norris, chief of the Berwyn Fire Company, which fields about 2,000 ambulance and 1,000 fire calls a year. That day may not be circled on the calendar just yet, but the long-range trend isn’t promising. The growing public perception is that local governments fully fund fire companies, resulting in less-than-robust donations of late. Other culprits include the widening gap between ambulance billings and payment, greater demand for advanced life support, reduced insurance reimbursements, rising personnel costs, expanded training requirements, dwindling volunteerism, increased government regulation, and grant funding that’s been slashed. In short, revenue is flat—or reduced—in the face of rising costs and need for services. Berwyn’s 13-year forecast spots trouble halfway through. “Based on what we know today, six to eight years out, we’ll be strapped financially,” says Tilden, who estimates that the company will break even this year per its operations budget of $1.4-$1.5 million. Meanwhile, Berwyn’s capital expenditures have been significant this year. A peek behind the bay doors of the 100-year-old firehouse on Bridge Avenue just off Lancaster reveals $5 million worth of rolling stock that needs periodic replacement: A new $950,000 tower-ladder truck and a $100,000 ambulance will soon join the fleet, and the company continues to repay $300,000 in state loans for two fire trucks. The company applied much of its 2009 surplus of more than $300,000 toward the purchase of the two new vehicles. More than half the tab for the ladder truck was paid with Pennsylvania Relief Association funds. The rest is covered by additional state loans and a combined annual capital contribution of $140,000 from Tredyffrin and Easttown townships. Tilden characterizes last year’s budget surplus as “not sustainable,” attributing the excess to belt-tightening in anticipation of the new vehicle purchases. Berwyn generates more than half its operating revenue from insurance payments for ambulance-related services, while the townships’ contributions account for about 20 percent and public fundraising 15 percent. The company receives $125,000 a year in rental fees from five mobile phone providers for the use of the tower on its property, and another $50,000 from grants and other rental income. Its principal expenses are salaries and benefits for paid personnel; other costs are associated with facility and vehicle maintenance, service delivery (e.g., disposable drugs), and day-to-day administration. Nine full-time employees—including firefighter emergency medical technicians and paramedics—staff Berwyn, whose workforce is bolstered by 60 volunteers. In providing services, “there’s no line between paid staff and volunteers,” says Norris. . . .
Berwyn typically receives about a 20-percent response to its biannual fund drives, buttressed by a November turkey raffle (which raises about $10,000) and an April dinner at Berwyn United Methodist Church. Fundraisers and other efforts to plug budget gaps can place a burden on fire company personnel who may lack the aptitude. “[Firefighters] didn’t sign up to raise money,” says Norris. In this economy, even small funding cuts seem ominous, which is why fire and EMS officials protested Tredyffrin’s 2010 budget, in which the township reduced its funding of its three fire companies—Paoli, Berwyn and Radnor—by about $20,000 combined. The 5-percent cut was part of a 15-percent budget reduction, says township supervisor Warren Kampf. A volunteer citizens board assisting the budget process had recommended deeper cuts for the three fire companies. Supervisors and residents subsequently raised more than enough money to make up the difference. Tilden certainly shares that perspective. “Maintaining a high quality of [emergency] service has an impact on property values. If insurance company ratings [for a given locale] are high, homeowner’s insurance costs less,” he says. With the proliferation of smoke alarms and sprinkler systems, major fires in this day and age have decreased. But when one strikes, equipment and manpower must be tuned and trained. Every company has a timetable for replacing vehicles. “The average life of an ambulance is three years, because you want a decent trade and have to keep up on technology,” says Norris. And as safety regulations multiply, so do costs. Likewise, service delivery costs are rising, especially for EMS and stepped-up use of paramedics (to provide advanced life support), a trend that Tilden attributes to an aging population and a more cautious approach by county dispatch. 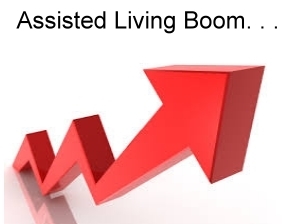 Expanding ALS has a direct effect on the bottom line, as companies that offer the service in-house (e.g., Berwyn) must add staff, and those that contract for it absorb a substantial difference between their cost and reimbursement.
. . . So while they all fight fires, Berwyn and Malvern provide in-house basic life support and ALS, while Paoli, Radnor and East Whiteland offer BLS only, and Valley Forge fire only. Some townships—like Radnor and Lower Merion—pay most of the purchase cost of new vehicles, while others pay for a relatively small portion through capital allocations. So the percentages of the budget contributed by local and state government, EMS/ambulance revenue, and public donations may vary wildly. It’s a far cry from the notion that government pays for everything. . . .
. . . . The Paoli Fire Company has six full-time employees (four firefighter/EMTs, two administrative), six part-time paid staffers, and 45 volunteers who mostly fight fires and provide EMS. It makes about 2,000 calls a year and expects to break even in 2010, says business manager Dan Green. He anticipates a $10,000 increase in net income next year—one that may be more than offset by a projected 15-percent bump in medical insurance premiums and additional higher costs. Beyond 2011, the outlook is murky. Though Paoli does take advantage of 2-percent state loans to buy new vehicles—and Chester County money at a rate that’s a few points higher to help finance site renovations—its funding is always in a state of flux. “We’re teetering on a delicate balance of these revenues,” says John DiBuonaventuro, a Paoli firefighter/EMT and a Tredyffrin Township supervisor. “These revenues” come from ambulance/EMS reimbursements, local government funding (aside from Tredyffrin and Easttown, Paoli receives a smaller contribution from Willistown), the state’s insurance relief program, and public donations. The amounts and proportions vary year to year. DiBuonaventuro opposed Tredyffrin’s funding cut for Paoli, Berwyn and Radnor last year. “Few politicians have the perspective of responder or victim,” he says. “New residents think their taxes pay for these services.” If volunteer levels continue to fall, says DiBuonaventuro, taxes will pay for firefighting and EMS—additional taxes, that is. Meanwhile, Green emphasizes that the 25-percent response to Paoli’s annual fund drive keeps the company rolling. How to Help Even if you don’t like hot places and high vantage points, you can help your local fire company level the playing field. The simplest and most effective way is to respond to annual fund drives. This is not, after all, a direct-mail campaign pitching the latest rejuvenating skin cream. Toss the mailer aside now, and one day in the not-too-distant future, it may well come in the form of a fee —with a higher dollar figure. “People can also help by joining the fire company,” says Berwyn chief Matt Norris. While battling blazes and providing EMS require rigorous skills and stoutheartedness, almost all firehouses welcome additional help with administrative and fundraising tasks. Berwyn Fire Company’s Annual Halloween Parade – Saturday, October 30th – Public Invited! The Annual Halloween Parade in Berwyn is this Saturday and the community is invited! Sponsored by the Devon-Berwyn Business Association, the Berwyn Fire Company is hosting their Annual Halloween Parade for the community. Please arrive by 6:45 PM so that the parade can begin at 7 PM. Open to all ages there will be prizes for the scariest, funniest, and cutest costumes. 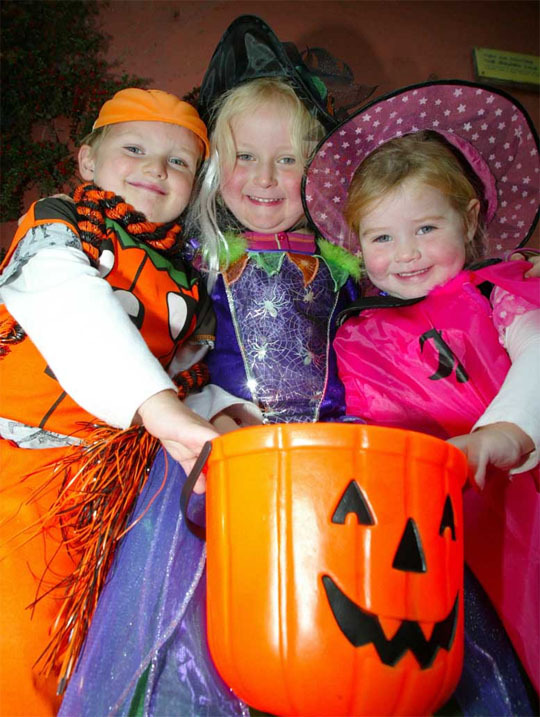 Following the parade, light refreshments will be served at the fire station – and judging of costumes! Thank you Berwyn Fire Company and Devon-Berwyn Business Association!